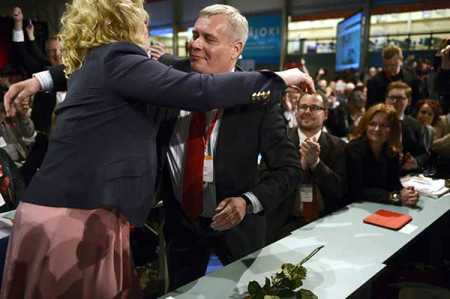 Newly elected Social Democratic Party President Antti Rinne hugs the outgoing president Jutta Urpilainen after the party congress in Seinäjoki on Friday. Photo – Lehtikuva. The Suomen Sosialidemokraattinen Puolue (Social Democratic Party) has elected Antti Rinne, the chairman of Pro Trade as its new chairman. Rinne takes over from Finance Minister Jutta Urpilainen, who led the party for six years. Rinne defeated Urpilainen in a tight race by 257-243 during the party convention in Seinäjoki on Friday. The first day of the convention on Thursday was inconclusive as it appeared many of the delegates were undecided. The 51-year-old Rinne has had a long career in trade union movement and as a lawyer. Urpilainen was graceful in defeat and thanked Rinne for the good work, saying democracy has spoken. The new SDP chief is not yet definite on the ministerial transition. Speaking in a press conference, Rinne said he will discuss the issue with the party hierarchy and his predecessor Jutta Urpilaien. “I think it is now important that the party council and the party board discuss the ministerial group after this convention,” said Rinne, adding that he will be ready to take the post which the group demands. It, however, emerged later that Rinne will join the cabinet but did not specify the exact post, according to an interview with Yle. Meanwhile, Reijo Paananen will continue in his role as the SDP secretary. Paananen was elected unopposed. He is also running in the upcoming European parliament elections. He has stated that he will carry out party obligations as its secretary, even if elected to the European parliament.